November 30, 2018, 10:22 a.m. The Prime Minister has campaigned hard for her Brexit deal over the past week, with reports suggesting that she’s going over MPs’ heads to appeal directly to the British public. This has included a tour of all four countries of the United Kingdom and a “letter to the nation” in which she set out the benefits of her proposals. It does seem like the Prime Minister’s does have some momentum and support for the deal is increasing. Our first poll for the Times, released the day after the deal was announced, showed she had a long way to go to win the public over – with just 15% in support, and over three times that number (51%) opposed. But five days later we had seen an 8% increase in support, with nearly a quarter (23%) in support and less than half (45%) opposed to the deal. Our latest polling out today shows another small increase in support, with 27% in support and 45% opposed. The remaining 28% say they don’t know. 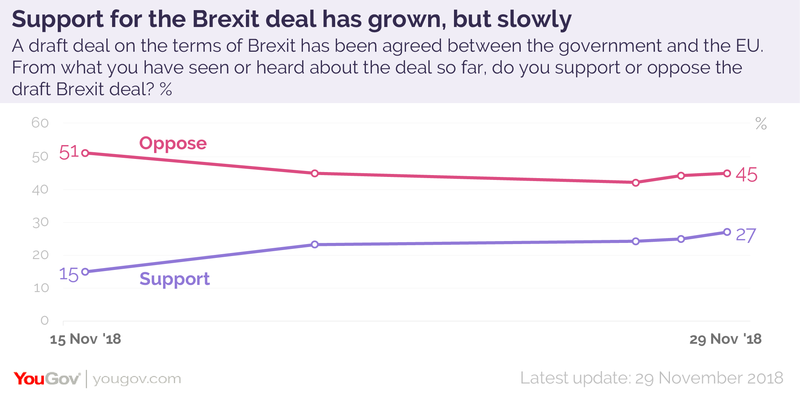 So although the Prime Minister can take some relief from the fact that the numbers are moving in her direction, she is still a long way from having more people support the deal than oppose it. Who is supporting the deal? Combining all the data from this week’s polling allows us to break these results down further. 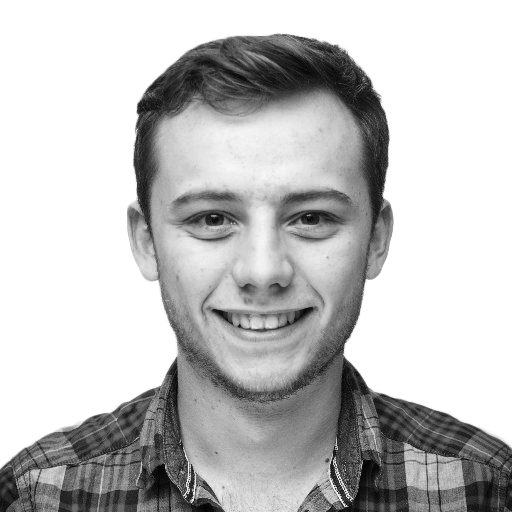 The group with the most favourable opinion towards the deal are Conservatives who voted Remain in the EU Referendum, with 52% of them in support and less than half of that (23%) opposed. 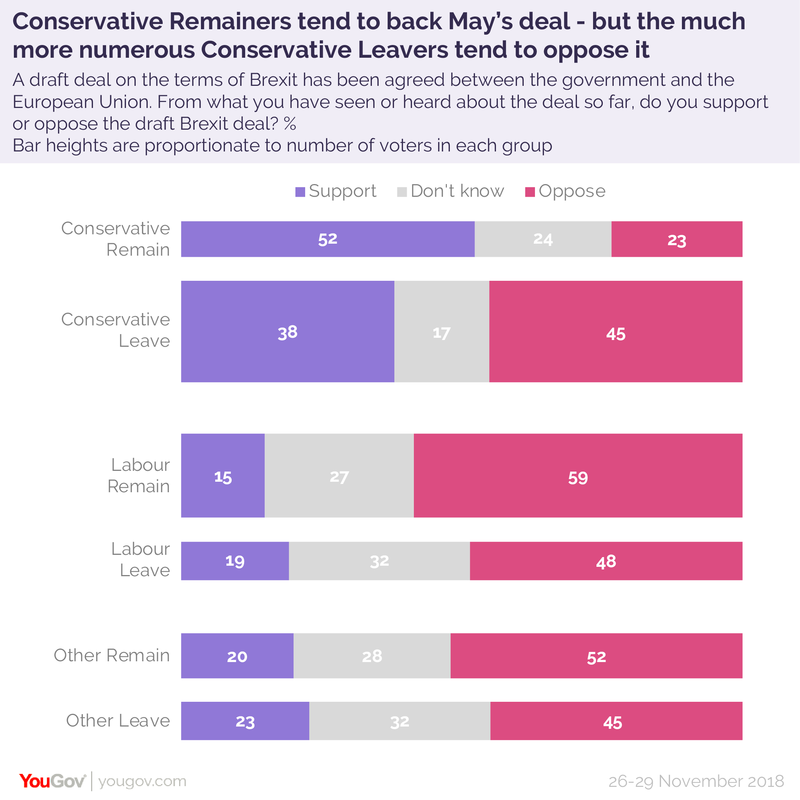 Unfortunately for the Prime Minister, there are over three twice as many Conservative Leave voters as there are Conservative Remain voters, and this group is less supportive. Just 38% of people who voted Conservative last year and Leave in the EU Referendum back her deal, with 45% opposed. This means the overall Conservative vote is almost completely divided, with 42% in support, 39% opposed. Over the next few weeks the Prime Minister will be hoping to win over more members of the public and expand this coalition. But she still has a long way to go in winning the public over.